Some debtors are stubborn, to put it kindly, and simply refuse to pay their accounts. So what should you do if you have unpaid debts and all your efforts are falling on deaf ears? Unless they are disputing the debt, we recommend lodging a default on the debtor’s credit rating. Why? You want to ensure that your unpaid debts are not going unheeded and that there will be some pain and consequences for not paying. · knowing that a default will stay on the debtor’s credit file for five years. · hurting their ability to gain credit with other suppliers and financiers. · demonstrating to others that you have had an issue and raising a red flag for those who may be considering extending credit to them. On a positive note, too, we see more payments being finalised once a default has been lodged. You may be thinking: Won’t that client dump us if we lodge a credit default? Yes, that is more than likely, but remember that you don’t need clients who don’t pay their bills. This is especially true if it is not an ongoing client and there is no relationship to salvage – it’s just about getting paid. In the case of a longstanding client it is quite often possible for us to identify problems in advance and resolve issues around why they are not paying on time (or at all). Properly handled, this process can strengthen a potentially toxic relationship. 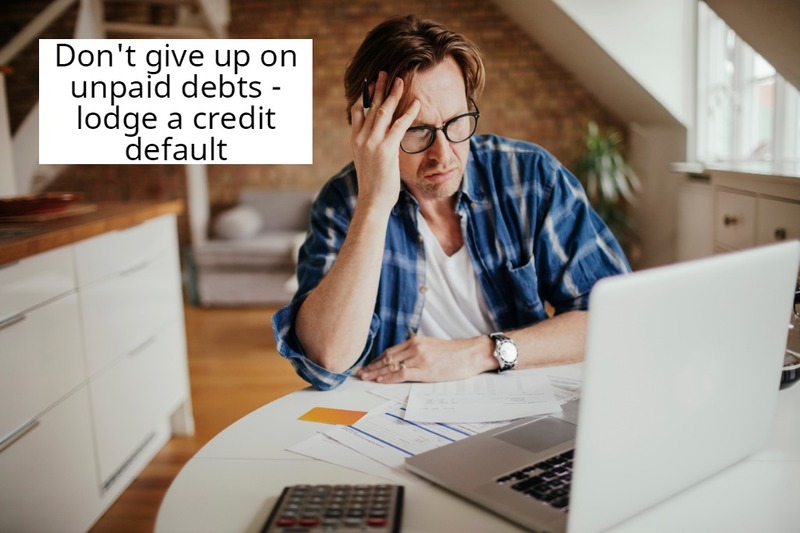 Once a credit default has been lodged, you will find that some debtors pay immediately in order for the default to be marked as paid, while others will contact you down the track when they need the default marked as paid. The latter typically happens when they are having trouble gaining credit elsewhere. Your debtor may approach you at any time in the five-year period following lodgement. Certain conditions must be met before a credit default can be lodged and our debt recovery process ensures these are ticked before we lodge on your behalf. The real message is simple – don’t close the file on unpaid debts. If you’ve had unpaid debts, before giving up ask us about lodging a default. It is often a good way to prod tardy payers – and ensure that you get your money.